Lukashenka and Putin agreed to resolve all critical problems in bilateral relations, including the oil and gas dispute. Belarus realises its largest ever investment project abroad – a potash plant in Turkmenistan. The official media resoundingly condemns protests against the 'social parasite tax'. Lukashenka approves the creation of a public security monitoring system in Belarus. The number of young men attempting to avoid military conscription in Mahilioŭ Region increases. Belarus tractor manufacturers continue to face difficulties. The Eurasian Economic Union recovers from economic recession. Lukashenka and Putin agree to resolve all critical problems in bilateral relations. The leaders of the two countries met in St. Petersburg on 3 April, writes Zviazda. According to Putin, both sides agreed to settle the oil and gas dispute within 10 days. They have been able to reach a compromise and are offering mutual concessions for the 2017-2019 period. Russia has also agreed to refinance Belarus's existing debt to the Russian Federation, promising to re-examine the ban on Belarusian food exports to Russia. Lukashenka, however, informed the public that: 'we did not start talks with oil and gas issues. The main focus was the security of our states… We agreed on cooperation in security'. Belarus completes its largest investment project abroad. Lukashenka visited Turkmenistan on 30 March for the inauguration of the Garlyk mining and processing plant, which will produce potash fertiliser. The project was fully realised by Belarusian specialists and became the largest project of its kind ever completed abroad by Belarus. According to Lukashenka, Belarus has demonstrated to the world that it can do anything; this is because Belarus has not squandered the powerful scientific and technological potential it inherited from the USSR. The plant is expected to produce 1.5m tonnes of potash annually and become one of the world’s largest exporters. Major media holding Belarus Segodnia published a variety of material criticising the activities of the opposition during the 'social parasite tax' protests and Freedom Day celebration on 25 March. It wrote that the demonstrations were illegal and Minsk residents should not get caught up in provocation; Belarusians should instead attend other cultural and sporting events held on the same day. The journalists emphasised the professionalism of riot police and accused the organisers of the demonstrations of fabricating footage for the world media rather than discussing public problems. The newspaper published numerous 'letters to the editor' condemning the protests. It also interviewed several refugees from the Donbass residing in Belarus, who argued that Belarusians should value the peace and stability in their country and not engage in protests. There will be no colour revolution in Belarus. Colour revolutions stem from foreign interference in the form of various non-governmental foundations and non-profit organisations, writes Narodnaja Hazieta. In such countries, governments themselves were highly dependent on foreign aid. In Belarus, however, the situation is fundamentally different. The democratically elected president was quick to restrict the operations of such organisations. The state has also managed to maintain control of the media and humanitarian sectors from the get go. A whole generation of Belarusians has been raised in a country without a massive influx of imported political values. The established social contract between the state and society has created a powerful social base which supports the authorities. The Belarusian economy, although experiencing transitional difficulties, can hardly be called weak, due to its industrial giants and booming IT sector. Lukashenka approves the creation of a public security monitoring system in Belarus. Such systems operate in many countries, where they have already proved their effectiveness, writes Belarus Segodnia. The introduction of automated processes of threat detection and data analysis will significantly increase the level of public security. In addition, the system will go a long ways towards reducing the amount of workers and resources involved in relevant areas, thus optimising the structure of state bodies. According to Interior Minister Ihar Šunievič, video surveillance will be installed in 2,000-4,000 places within a year or two. For private businesses and citizens, this will certainly not be an imposition, but rather an opportunity. Number of young men attempting to dodge the draft grows in Mahilioŭ Region. According to the regional prosecutor's office, this trend can be explained by inadequate military and patriotic education for youth, reports Belarus Segodnia. Some districts provide such education on paper only. Others do not organise meetings between military officers and young people at all, and schoolchildren never visit military bases. Many schools lack the facilities for pre-army training, such as shooting ranges, training camps, arms models, and more. On top of that, police and military conscription offices often fail to pursue conscripts who do not declare themselves following personal notification, and military bodies do not cooperate enough with the police. Belarus tractor producers continue to face difficulties. Despite the fact that the Belarusian tractor giant MTZ held 80% of the Russia market in 2012, in 2016 it only managed to retain around 40%, reports Sielskaja Hazieta. Since 2013, Russian producers have developed rapidly, tripling production by 2016. For this reason, Belarus is trying to mitigate its dependence on the Russian market – an endeavour president Alexander Lukashenka is personally involved in. For example, after his visit to Pakistan in 2016, the country purchased 25% more Belarusian tractors than it had in 2015. Despite these difficulties, MTZ hopes to increase sales and has recently presented its products in the UK. Eurasian Economic Union recovers from economic recession. Zviazda interviewed the Minister for Integration and Macroeconomics of the Eurasian Economic Commission, Tatiana Volovaya. In 2016 the GDP of the EEU decreased by only 0.1% – much better than the 2.3% drop in 2015. Moreover, the GDPs of Armenia, Kazakhstan, and Kyrgyzstan have grown. Trade within the EEU has grown since January 2016 and was 38% higher in January 2017. The Eurasian Economic Commission predicts 0.9% growth in the EEU in 2017. It expects the positive trend to continue in 2018-2019. As for Belarus, it shows the highest potential in metallurgy, machine building, the chemical industry, and logistical services. 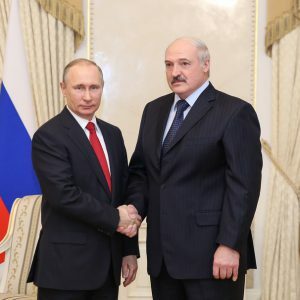 On 3 April, Belarusian president Alexander Lukashenka succeeded in securing concessions from Vladimir Putin following a year-long oil and gas dispute between the two countries. In order to reach a deal, Minsk put the idea of buying oil from non-Russian sources back on the table. On 15 February, the news source Reuters reported an oil deal between Belarus and Iran. It involved 80,000 tones of Iranian oil which were indeed delivered on 24 March to the Ukrainian port of Odessa for subsequent transport to Belarus. Over the past decade, Minsk has already gained more experience than its neighbours in securing alternative oil sources; it has been able to secure both Venezuelan and Azerbaijani oil before. Although the deals were short-lived, the Kremlin's reaction to these manoeuvres proves that it takes the Belarusian government's efforts seriously. Oil from non-Russian sources: Has Minsk reported only a fraction of its imports? Both Belarus and Iran released minimal information regarding their February oil deal. All publications made reference to Reuters, adding only cursory commentary. Even the National Iranian Oil Company (NIOC), the seller of the oil, based its press release on the Reuters report. This is in line with the policy of the Belarusian government to shun publicity in its efforts at diversification. According to Reuters, in 2016 Belarus imported a total of 560,000 tones of Azerbaijani oil, but these deliveries stopped in January 2017. Only a handful of these deliveries – just 84,000 tones – were reported in the media before Reuters published its report on 15 February. Remarkably, it was Beloil Polska, the Polish subsidiary of the Belarusian Oil Company Belarusneft, which closed the deal on the Belarusian side. On 20 February, Polish security and energy expert Piotr Maciążek wrote a piece for the well-informed Energetyka24 web outlet suggesting that Belarus was buying Iranian oil with Polish assistance. He argued that Belarus's deal with Iran on oil delivery could have been linked to another deal regarding Iranian oil supplies to Poland. To conclude its agreement agreement with Tehran, Minsk may even have used the direct support of Warsaw, which is rapidly developing relations with Iran. The fact that the very same NIOC press release about the oil deal with Belarus made reference to an Iranian oil delivery to Poland supports this hypothesis. There are good reasons to believe that Minsk's move to buy Iranian oil is politically motived by the need to counter Russian pressure. 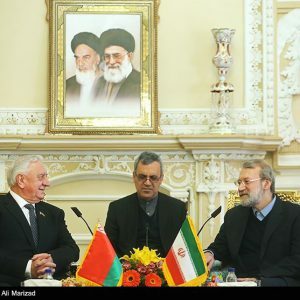 After all, Minsk reportedly purchased only 80,000 tones from Iran, and the deal was completed as a spot transaction; it involved no longer-term commitments. Most commentators also believe that this oil is to be transported by rail; if Minsk planned to import larger volumes of Iranian oil on a more regular basis, it would make more sense to use Ukrainian pipelines. However, two facts indicate that Belarus most likely plans to import oil via Ukrainian pipelines in the future. In November 2016, Ukrainian minister for regional development Hennadi Zubko reported that Ukraine would possibly be transporting Azerbaijani and Iranian oil to Belarusian refineries. Moreover, on 21 March, the Ukrainian pipeline operator Ukrtransnafta announced the re-opening of an oil pipeline between Belarus and Ukraine. By buying oil from Iran and Azerbaijan, Minsk is reacting to the Kremlin's attempts to impose its own terms of economic cooperation and integration on Belarus. After the beginning of the latest gas dispute between Minsk and Moscow, in 2016 the Kremlin reduced its oil exports to Belarus from the formerly agreed 24m tones to 18m tones. Oil refinement and sales of reprocessed oil products constitute a major source of income for the Belarusian government, so the reduction of supplies dealt a blow to the financial situation in Minsk. On 3 April, Belarusian Economy Minister Uladzimir Zinouski directly linked the contraction of the Belarusian GDP in January-March to the reduction of Russian oil imports. Belarusian refineries received less oil, and thus produced less oil products for export. This, however, is not a new problem for the Belarusian leadership. In 2010, Minsk faced similar problems securing enough Russian oil on favourable terms, so Lukashenka made an oil deal with Venezuela. Belarus, however, is a landlocked country dependent on its neighbours – primarily the Baltic states and Ukraine – for access to the sea, by which the oil must be transported. In July 2010, the Belarusian government signed an agreement with Ukraine on use of the Odessa-Brody pipeline to transport oil from the Ukrainian Black Sea port of Odessa to Belarus. Minsk guaranteed it would pump through Ukrainian pipelines at least 4m tones yearly in 2011-2012, and even hinted at the possible extension of the agreement after 2012, with the oil volume increasing to 8m tones. At the same time, Minsk was negotiating with the Lithuanian port of Klaipeda over the possible transport of 2m tones of non-Russian oil yearly on a long-term basis. There were similar negotiations with Latvia and Estonia. Oil deliveries also took place via the three Baltic states subsequently. As long as Belarus planned on buying Venezuelan oil, schemes involving millions of tones seemed fanciful. Very soon, however, Lukashenka managed to convince Azerbaijan to join the Belarusian-Venezuelan oil deal through swap contracts. Thus, in place of direct deliveries from Venezuela, since 2011 Belarus has been receiving Azerbaijani oil. Under these circumstances, receiving 4m tones a year seemed like less of a fantastic target, although in total Minsk received only one million tones via the Ukrainian pipeline in 2011– about five per cent of what it needed. Naturally, Moscow was irked by Minsk's plans, which were becoming reality. In the end, however, the Kremlin's hands were tied and it eventually gave in: by the end of 2011, Minsk had succeeded in getting Russian companies to sign oil agreements more or less on the terms the Belarusian government had wished. Belarus then stopped importing non-Russian oil until 2016. This history certainly raises questions about the seriousness of Minsk's intentions to diversify its energy sources. This is as true now as it was in the early 2010s. Nevertheless, the scale of the commitments and risks the Belarusian government was prepared to take vis-a-vis Moscow and Kyiv in 2011 in order to import non-Russian oil proves that Minsk is ready and willing to diversify should Russia prove intractable. At present, Minsk's moves towards diversifying its energy sources seem more modest. But they could turn out to be larger than currently thought: some deliveries could remain unreported, as the post factum revealed data about the volumes of 2016 imports of Azerbaijani oil prove. Last but not least, in either scenario Moscow has capitulated: the Kremlin seems to be taking Minsk's diversification efforts seriously.